You'll feel right at home in the cosy rooms in Vitalhotel. We can promise you this – it won't be difficult. Every single room offers a really comfortable stay and enough space for you to feel great. Equipped with everything you need for your hotel stay, you can feel relaxed as you head out from your holiday accommodation into the natural surroundings around the Dachstein region. The loveliest thing about staying the night in Vitalhotel Gosau becomes apparent the minute you look out of your window – the surrounding area. Wherever you look you will be amazed by the impressive natural surroundings. The impressive Alps on one side, the Dachstein glacier on the other. Lush green alpine pastures and expansive fields in the summer, and a snow-covered wonderland in the winter. When you open the window you get to breathe in the pure mountain air. What can you here? Nature. After all, the hotel is in a wonderful tranquil location in the contemplative mountain village of Gosau. In the middle of the Salzkammergut. Vitalhotel Gosau has rooms to suit every guest. You are sure to find a room category which suits your specific requirements. 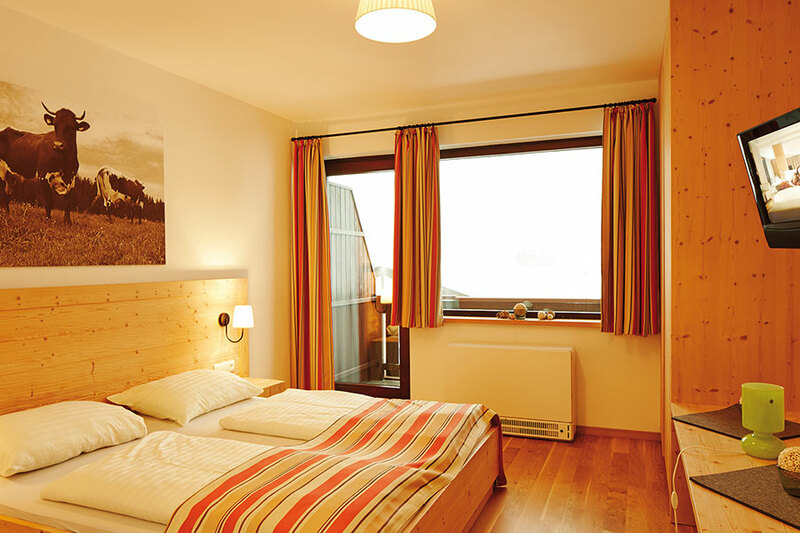 If you are heading away on holiday with your partner or with friends in the Dachstein region, a spacious double room is an ideal place for an overnight stay. Families with children will find optimum facilities in the two areas in the family room, while business travellers are well catered for in a large studio which has its own working area. What all the rooms have in common – you will find everything you need: a mini-bar, a desk, satellite TV, slippers, bathing robes and a hair-dryer. Dreamy views are included. All rooms are also non-smoking rooms. For a perfect family holiday, cots and additional beds are provided too. Those who want to, (on request) can even bring their beloved pet with you on holiday. What matters to us is that you should want for nothing during your overnight stay in Vitalhotel Gosau. 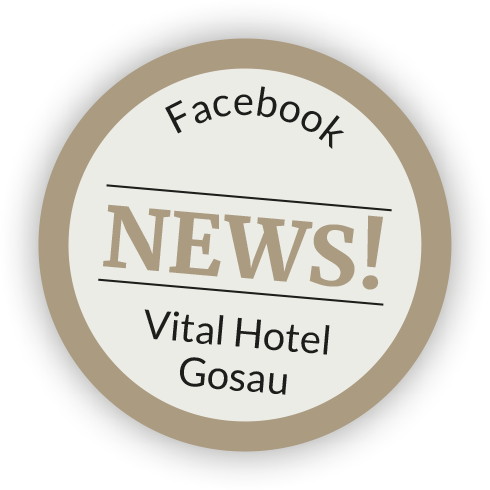 The emphasis is on service in Vitalhotel Gosau. Should you have any questions or need some assistance – our room service staff will be happy to help. Staying longer? Then why not make us of our laundry and ironing service, which will make your stay in Gosau even more relaxing. What room category best suits your needs? Send us a no-obligation holiday enquiry about your overnight stay in the heart of the Salzkammergut right now. We look forward to welcoming you! Catering: All Inclusive. All prices are per person and day including all taxes and duties but excluding visitor taxes of € 2.00 per person per day, payable from those aged 14 and over. Visitor taxes are payable when you get here. Single room surcharge: € 15.00. Discounts for children: 0 – 11.9 years old 100% | 12 – 15.9 years old 30 % | Ages 16 and over 10%. You should also note: all-inclusive: buffet breakfast with hot and cold dishes and healthy food, afternoon snack or packed lunch, coffee and cake served from 3:00 p.m. to 4:00 p.m. And ice-cream for children, welcome drink, evening meal: themed buffet or menu to choose from, drinks included from 10:00 a.m. to 9:00 p.m., the following drinks are included: beer, wine, soft drinks, fruit juices, local fruit brandy, coffee, tea. Entertainment: hotel has its own entertainment programme – see the notice boards (e.g. : hikes, cycle tours, climbing, archery..), taster climbing sessions on our own climbing wall, hammocks in the garden providing views to the Gosaukamm Ridge, archery at Wilderer Stand, two different children's entertainment programmes (organised to suit different age groups) – for the programme see the notice boards, new children's play park. For a fee: massage treatments, an introduction to Nordic Walking, wine tasting, E-Bike hire, excursion train rides. Free hire: mountain bikes (when available), Nordic-Walking poles (when available), wellness package (bathing robes and slippers). Children: children's club for those aged 3 and over, organic juice bar for children. 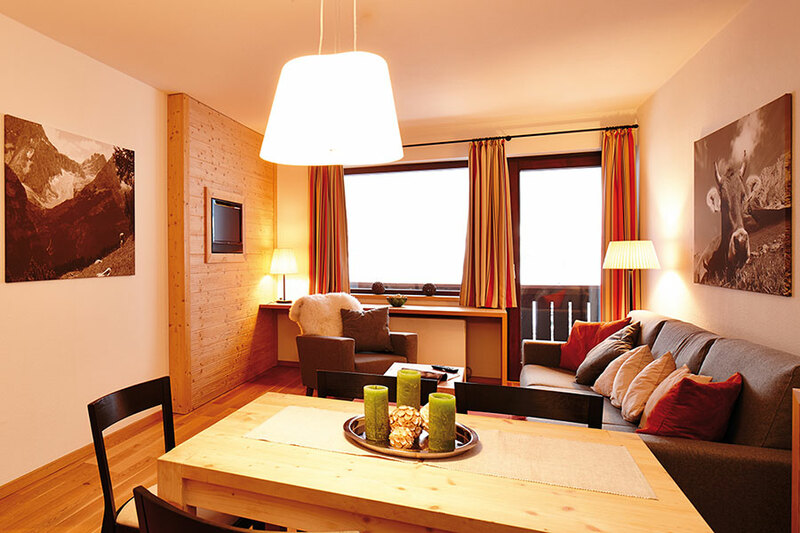 Spacious, bright and welcoming – double rooms in Vitalhotel Gosau. And they are cosy too. When you take a look out of the window for the first time, you know that your holiday has started. For the nature which surrounds you promises pure relaxation – whether it be the lush alpine pastures in the summer of the snow-covered mountains in the Dachstein region in the winter. Another plus for your stay in Gosau is the total tranquilly location. Feel right at home in your double room. Get cosy in the lounge area and read a good book. Turn off the television and treat yourself to a snack from the mini-bar. Sit at the desk and write about your holiday adventures. Organise the space to suit your personal taste. Treat yourself to a relaxing time in your home from home and start another day relaxed. After all, the Salzkammergut is packed full of opportunities for journeys of discovery and activities in the natural surroundings. All images are room examples. The family rooms in the tranquilly located Vitalhotel Gosau are cosy and both rooms provide plenty of space for relaxation. The cosy lounge area is particularly effective – the couch doubles as a sofa bed. Make the most of the sunshine and step out on to the balcony in the summer and enjoy views, which you seldom get the chance to see. Views to the unique natural landscape in the Dachstein region. Whatever direction you head, lush pastures and impressive mountains like the Gosaukamm Ridge and the Dachstein Glacier are there waiting to amaze you. That's a promise! As a hotel which welcomes infants and babies, we provide cots and additional beds for you. There is also the option to avail of our child supervision service, which means you will have a few moments of tranquillity to yourself in the knowledge that your children are in good hands. One thing is certain – the family rooms in the Vitalhotel Gosau provide plenty of space for everyone. And is you want to head out, a natural landscape providing an almost unlimited range of leisure facilities awaits all the family. The family room is also available as superior (newly renovated) with a surcharge of € 20,- per person per day. Get cosy in your own studio. The rooms provide plenty of space, exactly what our guests want when they are on holiday. You get to relax and unwind, without disturbance, in the cosy lounge area during your free time. A desk is available for any work you need to take care of. Thanks to the hotel's tranquil location, you will enjoy undisturbed surroundings to get some work done. An ideal setting for business and seminar trips. For families and groups of up to four people the studio is a great place to stay during a holiday. The studios in Vitalhotel Gosau score points, not just on account of their spaciousness and comfort. From the balcony a legendary view to the natural surroundings in the Salzkammergut area opens up: lush pastures in the summer and the snow-covered Gosaukamm Ridge in the winter. And the fresh mountain air to boot. You will only find panoramic views like this in the Dachstein region. And in your studio in the seminar hotel in Gosau. The studio is also available as superior (newly renovated) with a surcharge of € 20,- per person per day. Do you want your holiday in Vitalhotel Gosau to be a special experience? Well that isn't difficult – the options available for leisure activities around the hotel are almost limitless. Throughout the year too. The natural surroundings in the Salzkammergut region and the mountains of the Dachstein region provide a variety-packed activity programme in the summer and winter alike. To make planning a bit easier just choose a bespoke holiday package – we have something to suit everyone! Our attractive offers take your own personal wishes and preferences into account. Whether it is a family holiday, skiing fun, a romantic trip or an activity-filled weekend. They include an all-round programme of indulgence, with an extensive buffet breakfast, a choice of menus for your evening meal or a themed buffet. To ensure you enjoy plenty of relaxation, entry to the hotel's own well-being area, the Vitaloase, is included. By way of an encore, the legendary views to the Dachstein from your hotel room is free!